Eat your way through Los Angeles' Koreatown, one of the hottest culinary neighborhoods in Los Angeles and the largest Koreatown in the United States boasting delicious traditional Korean and innovative Los Angeles cuisine. Come join us on a 4-course progressive meal where each course is served at a different restaurant. Your 3 hour food tour will begin with appetizers, followed by an entree and conclude with dessert. Your expert guide will entertain you with stories of restaurant owners, chefs, and industry experts as well as delightful culinary and neighborhood history along the way. 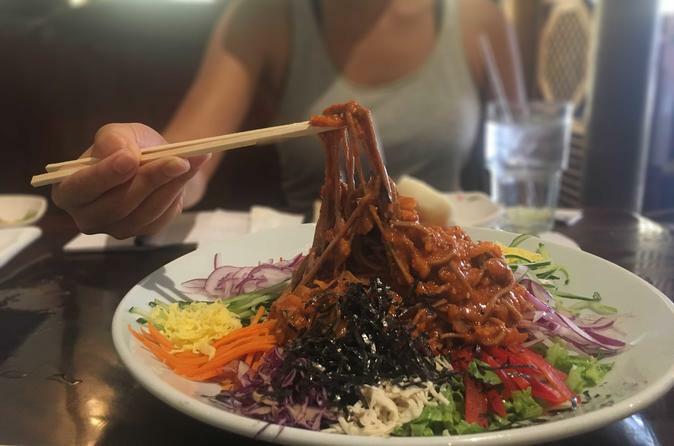 They'll guide you through traditional Korean culture and cuisine as well as how Ktown has become one of the hottest and edgiest Los Angeles culinary scenes. - Finger-lickin delicious Korean Fried Chicken Wings at historic red leather booth restaurant featured in Mad Men and other Los Angeles TV shows. Alcohol pairing option is available upon arrival at the tour. Come eat with us!